The Heartland Fall Forum is a regional trade show attended by some 350 independent bookstores located in the Greater Midwest US area. Kathleen will be signing copies of The Lacemaker's Secret, her new, ninth Chloe Ellefson Historic Sites mystery, from 11:30 AM to 12:30 PM, Friday, October 5th, at the table of publisher Midnight Ink Books. Attendance at the Heartland Fall Forum is open to authors, wholesalers, distributors, sidelines vendors, librarians, teachers, media, book bloggers, and others who are current members of the Great Lakes Independent Booksellers Association (GLIBA) or the Midwest Independent Booksellers Association (MIBA). NOTE: Access to the Fall Forum requires a paid registration. Kathleen will be speaking about her just released ninth Chloe Ellefson mystery, The Lacemaker's Secret, as part of the Great Fire (Peshtigo Fire) Remembrance event at the Belgian Heritage Center on Sunday, October 7th. The new book is set in 1983 amongst the Belgian-American communities of southern Door County, WI, and at the Belgian Farm at Green Bay's Heritage Hill State Historical Park. There is also an historic thread that starts in 1848 in the Kingdom of Belgium, and continues from 1854 through 1919 in Door County. The historic story focuses on the struggles of a Belgian lacemaker and her family to survive cholera, famine, our Civil War, the Great Fire, and World War I to pioneer a new life in America. 09:00 AM - Doors open. 10:00 AM - Presentation about the Great Fire by Barb Chisholm. 11:15 AM - Program about The Lacemaker's Secret by Kathleen Ernst. Up next will be by a Booyah Lunch and Kathleen signing books (copies will be available for purchase) followed at 1:30 PM by a repeat performance about the Great Fire by Barb Chisholm. The two programs are free and open to the public. There may be a charge for lunch. Today is the official publication date for The Lacemaker's Secret, the ninth book in the popular, Wisconsin-based, award-winning Chloe Ellefson Historic Sites mystery series. The story takes place in Green Bay and Door County Wisconsin in November 1983, with an historical thread set there and in Belgium from the mid-1800s through World War 1. Starting today (if not already) the book will be available in trade paperback and multiple ebook formats from a wide variety of vendors, including Independent bookstores and Amazon, Barnes & Noble, Books-A-Million, Kobo, Target, and others. 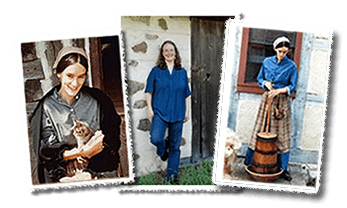 Kathleen will be Larry's guest from 11:00 AM to 11:40 AM, discussing and taking calls from listeners about her Wisconsin-based Chloe Ellefson Historic Sites mystery series, and her just released ninth Chloe book, The Lacemaker's Secret. The new book is set in 1983 at Green Bay's Heritage Hill State Historical Park and amongst the Belgian-American communities of southern Door County, WI. The popular, long-running Larry Meiller Show has an audience of some 100,000 listeners. It is broadcast statewide, and can also be heard in eastern Iowa and Minnesota, and northern Illinois. HEAR IT LIVE. Larry's show is streamed live over the Internet and broadcast over WPR's Ideas Network (AM 930, 970, and FM 88.1, 88.3, 88.7, 88.9, 89.1, 90.3, 90.7, 90.9, 91.3, 91.7, 91.9, 107.9). JOIN IN. Listeners are encouraged to contact the show to ask questions and make comments. This can be done via Facebook or Twitter, by email to talk@wpr.org or by calling (800) 642-1234. LISTEN LATER. After the broadcast the show will be made available on the The Larry Meiller Show archive page for streaming or downloading as a podcast. A copy of the show will also posted for listening to on The Lacemaker's Secret book page on Kathleen's website. Join bestselling Wisconsin author Kathleen Ernst as she celebrates the release of The Lacemaker's Secret, the ninth and newest book in her award-winning Chloe Ellefson Historic Sites mystery series. Kathleen will be greeting Chloe fans, talking about the new book, and autographing copies from 6:30 PM to 7:30 PM on Thursday, October 11th. As in previous years, there will be door prizes and a delicious book-themed dessert. The event is sponsored by Mystery To Me, Madison's premier mystery bookstore, which will have all the Chloe mysteries available for purchase. This will be the very first opportunity in the Madison area to acquire a signed copy of the new book. NOTE: The store asks people to pre-register for this event. Make a free reservation by clicking HERE. Come party with Kathleen as she celebrates the release of her thirty-seventh published book! Signing Books Where Chloe Works. Meet bestselling author Kathleen Ernst, creator of the award-winning Chloe Ellefson Historic Sites mysteries featuring protagonists Chloe—a reluctant sleuth who works at Old World—and her romantic partner Roelke McKenna—a cop in the nearby Village of Eagle. Kathleen's just released ninth Chloe mystery, The Lacemaker's Secret, is set in 1983 at Green Bay's Heritage Hill State Historical Park and amongst the Belgian-American communities of southern Door County, WI. There is also an historic thread that starts in 1848 in the Kingdom of Belgium, and continues from 1854 through 1919 in Door County. It focuses on the struggles of a Belgian lacemaker and her family to survive cholera, famine, our Civil War, the Great Fire, and World War I to pioneer a new life here. On Saturday, October 13th, Kathleen will be greeting visitors and signing her books from Noon to 5 PM in the Old World museum store, where copies of all her Chloe mysteries are for sale. This will be the first opportunity in Southeast Wisconsin to get a signed copy of the new mystery. Kathleen is also the author of a non-fiction history book, A Settler's Year: Pioneer Life Through The Seasons, beautifully illustrated with photos of Old World Wisconsin taken by Loyd Heath. Copies of this book will also be available. Kathleen writes mysteries as well as historical fiction and non-fiction for adults and young readers. Her work has earned numerous honors, including an Emmy, a Chicago LOVEY Best Traditional Mystery Award, and an Anne Powers Prize for Best Fiction Book from the Council for Wisconsin Writers. To date readers have purchased over 1.7 million copies of Kathleen's thirty-six published books. Kathleen will be meeting the public and signing copies of her most recent Chloe Ellefson mysteries -- the just released The Lacemaker's Secret and the Mineral Point-based Mining For Justice. This free, public event will take place at The Cornish Corner in charming Mineral Point, Wisconsin, from 1 to 3 PM on Saturday, October 20th, during the popular Fall Art Tour. Kathleen's visit will also include a demonstration of making bobbin lace, which is featured in The Lacemaker's Secret. Oconomowoc's independent bookstore, Books & Company, has invited Kathleen to meet local readers and sign copies of her Chloe Ellefson mysteries, from 7-8 PM on Tuesday, October 30th. The Lacemaker's Secret is Kathleen's just-released ninth book in this Wisconsin-based historic sites series. The story is set in 1983 at Green Bay's Heritage Hill State Historical Park and amongst the Belgian-American communities of southern Door County, WI. Kathleen is a frequent guest on Wisconsin Public Radio's The Larry Meiller Show discussing her Chloe books, one of which was read by Jim Fleming on WPR's Chapter A Day program. Kathleen writes mysteries as well as historical fiction and non-fiction for adults and young readers. Her work has earned numerous honors, including an Emmy, a Chicago LOVEY Best Traditional Mystery Award, and an Anne Powers Prize for Best Fiction Book from the Council for Wisconsin Writers. To date readers have purchased over 1.7 million copies of Kathleen's now thirty-seven published books.